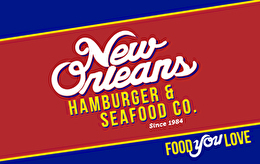 New Orleans Hamburger & Seafood Co. is a very casual and attentive homegrown eatery that consistently serves only the freshest, most satisfying local dishes at a value that excludes none. We understand our customers' expectations and we take our responsibility seriously to give them MORE than just another meal. Come get the Food You Love at New Orleans Hamburger & Seafood Co.
For balance inquiries call the phone number to a New Orleans Hamburger & Seafood Co.'s location below.